I'm told that when I was little, my favorite thing to do was to follow my Grammy around. My Mom called me Grammy's shadow and I have always enjoyed that title. I know I wasn't the only grandchild to tag along with Grammy anytime there was an opportunity; but I'd venture a guess that I was in her shadow more than most because my family was blessed to live so close to her and Grandad. Now I have some of my own shadows from time to time and there is nothing sweeter. I love each and every one of them more than life itself. When I celebrated my 15th birthday some years ago, Pop was my boyfriend...not my husband just yet. He gave me a big teddy bear for that birthday that I still have and the old guy has shown some wear and tear lately..the bear...not Pop. The grandkids have had different reactions to this teddy bear that Pop named Albert all those years ago...Albert is not so plush and cuddly as he once was and his red felt tongue mostly came off a long time ago. To add insult to injury, one toddling grandchild chewed most of his nose off. Just the other day, our Superhero grandkids were visiting at the farm while their folks went on a date and tender-hearted Supergirl had several of the Four Sisters Farm stuffed animals out to play and noticed Albert had a rip under one arm. She came asking for help and of course I was happy to oblige. After all, we can't have animal stuffing falling out around here! We checked Albert into our makeshift teddy bear hospital (my sewing space) and got to work stitching up the hole under his arm. Supergirl and I were joined by two of her superhero brothers who were interested in Albert's well being. One commented that Albert needed his nose fixed and the other that he needed a smile where his tongue had been. We fixed him up and now I regret that we didn't get a picture when he checked in...but we did take a picture after his makeover with the superheroes for the world to see and sent pics immediately to the Four Sisters to let them know that Albert had undergone plastic surgery and they all replied...but Pretty Princess really cracked me up with her response. She said, "Ha ha! Roarnoplasty seems to be the latest in bear plastic surgeries these days!" All the Four Sisters make me laugh but they know one of my favorite things is a good pun. Nicely done, Pretty Princess! 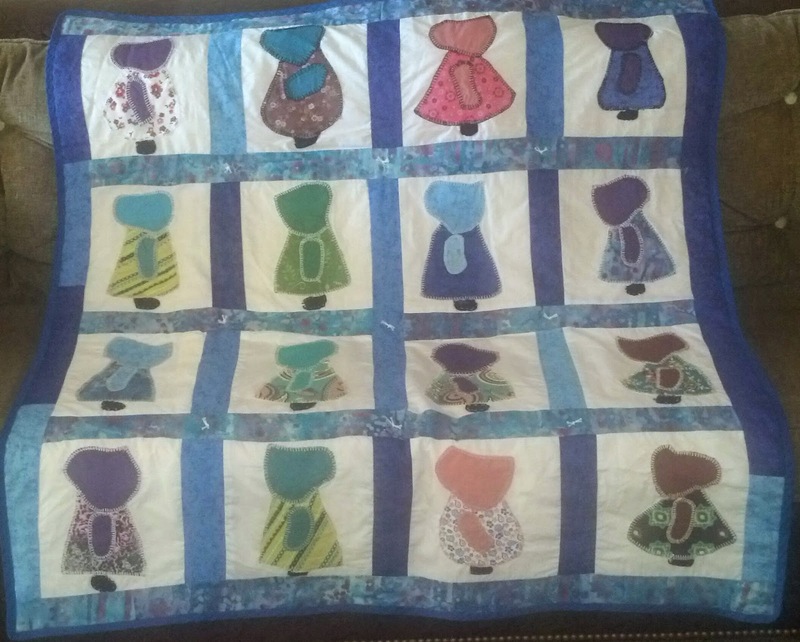 My mom had asked for some help to take four quilt tops she had been given and put them together with batting and backing...and bind them...and tie them...then deliver them to a nearby children's home. The story is that my dad's recently passed away cousin, along with her husband, used to make quilts and donate them to this particular home. 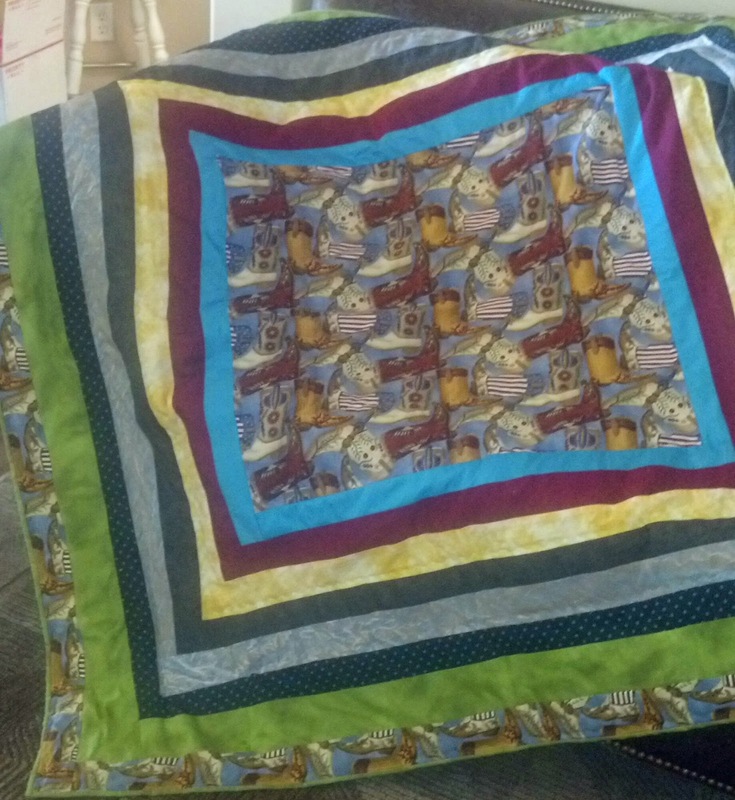 Mom and Dad thought it would be nice if we finished up these quilts and donated them in her memory. I told her yes (because I pretty much still do what she tells/asks of me) and I brought everything home...where it sat for a good long while. The quilt tops were interesting to say the least. They were the products of someone's unfinished work. They were not colors or patterns I was drawn to at all. Some of the work was not as well done as I thought I should have been. In short, I didn't much care for these quilt tops and only my promise to Mom and Dad inspired me to finish them. As I talked with my friend "Daina" one day and told her about these quilts that I needed OFF my to-do list, she offered encouragement and prayer and a promise (threat) that she would require a status update in a few days. I started in. As I began the process of pressing, batting, tying, and binding them it occurred to me that I was a snob. It wasn't that I didn't have the time to do the work...I simply hadn't made it a priority because I didn't think they were up to my standards...PRIDE was standing in my way of offering four children snuggly, warm quilts to call their own. As I sewed, I humbled myself and found my softened heart broken by the truth. I felt God compelling me to complete this work to the best of my ability, in spite of what I started with. I felt the Truth wash over me that these quilts were much like me...in need of work. I confessed my pride and thanked God for the fact that He makes all things beautiful in His time (even me), I thanked Him that He takes the rags of our lives and makes all things new. I finished the first three in a short time...oh, but the fourth...it appears to have been hand stitched by an older woman with poor eyesight out of old fabrics that don't really go together. As I pondered what to do, I told my Mom about it. I feared that if I put it together as I had the other three, it would fall apart in the wash...literally. 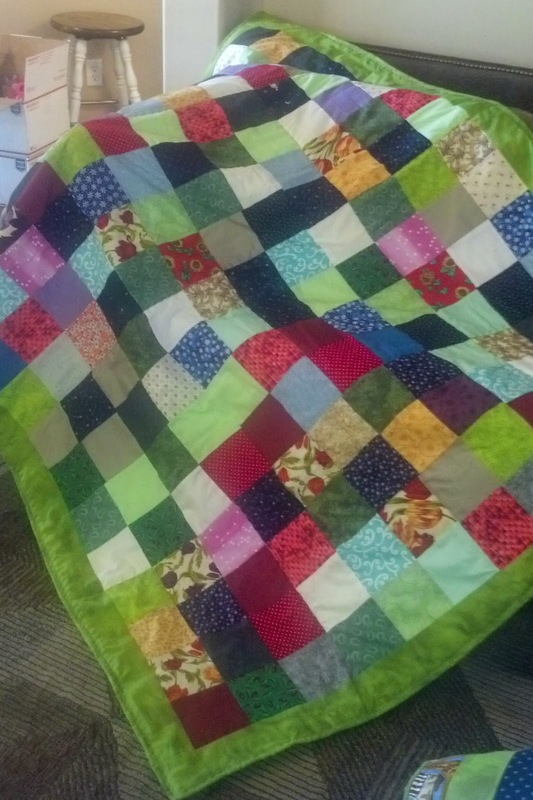 I knew it would require hand quilting in order to be used, washed, and loved. Mom released me from it, saying she was sure I had more important things to spend my time one. But I couldn't let it go...I was compelled to finish it. Now I see these quilts in a completely different light. I see beauty, comfort, and warmth. I see the hard work of other seamstress' hands used for a purpose they could not foresee and that I was called upon to complete. I see fabrics that may remind a child of a dress their mother, grandmother, or sister used to wear or that feels like their father's shirt. I pray that God will take them and use them to speak love to four children in a way that only He can. I pray that He will wrap His arms around them as they wrap in these quilts and that they will feel His total and unconditional love in pieces of fabric stitched together to make unique quilts...much like God pieces together the events of our lives to make something beautiful in His time.